If you always have your eye on the latest health trends, no doubt you have come across a discussion about bone broth. This morning there was a segment on the Today Show all about the health benefits of bone broth and how to make it. I was surprised because I have been making bone broth ever since I can remember…really it is just a fancy word for homemade stock made with the bones of an animal. I used to work with an Asian woman who drank bone broth for her entire pregnancy. Apparently this was encouraged for the health of both mother and baby. When I started doing a little bit of research on how to make bone broth I came across some interesting facts that I thought I would share with you. What is Bone Broth? How does it compare to homemade stock? Bone broth is made with the bones of animals and is usually simmered for a long period of time. Up to 48 hours according to some of the sites I was looking at. Simmering the bones that long helps extract all of the minerals from them, which is what makes bone broth so nutrient rich. Stock is made with mostly meat and only a few bones. I didn’t know this, honestly, because I have been making my homemade stock with bones. They are usually very cheap or free with the cost of your evening’s dinner. When making bone broth, the bones are often roasted first to add flavor and then simmered for up to 48 hours. By the end of your cooking time, the bones may actually crumble they become so soft. Bone broths are extremely rich in nutrients, especially amino acids and minerals. 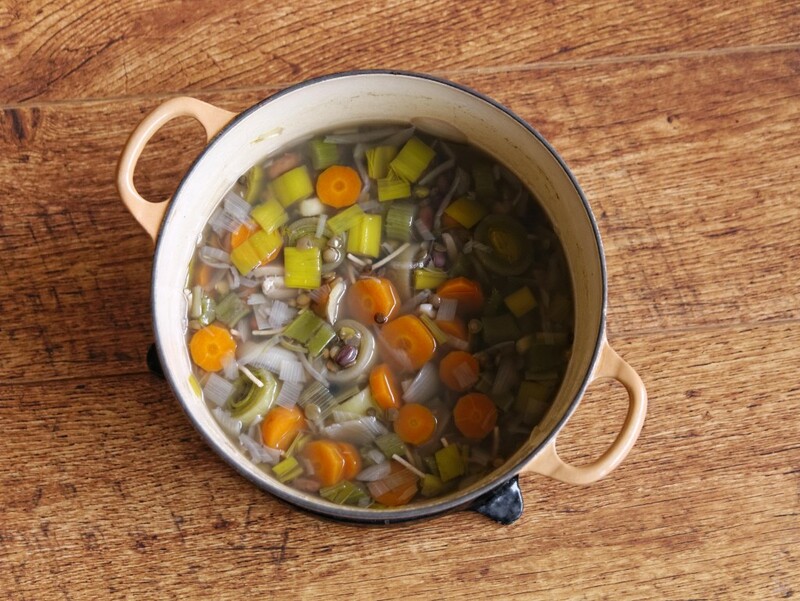 Amino acids like arginine, glycine, and proline that are found in this broth help detoxify the body, support digestion, help improve skin health and even improve your immunity. Calcium, magnesium, phosphorus and other trace minerals are found in high concentrations in bone broth and they are much more readily absorbed by the body when compared to a multivitamin/mineral supplement. Homemade bone broths are also rich in gelatin, which is an inexpensive source of protein. Gelatin helps to support the connective tissue in your body to help guard against joint problems. It also helps your fingernails and hair to grow stronger. Can I just use store bought stock instead of homemade bone broth? Like most foods, things that come off of grocery store shelves in boxes and cans are heavily processed and lack the nutritional value of homemade foods. Bone broth is no exception. The box of stock you find in the soup isle is a poor imitation of homemade bone broth in both taste and nutrient levels. They are also very expensive compared to making it yourself and usually contain large amounts of salts and other added ingredients your body doesn’t need. 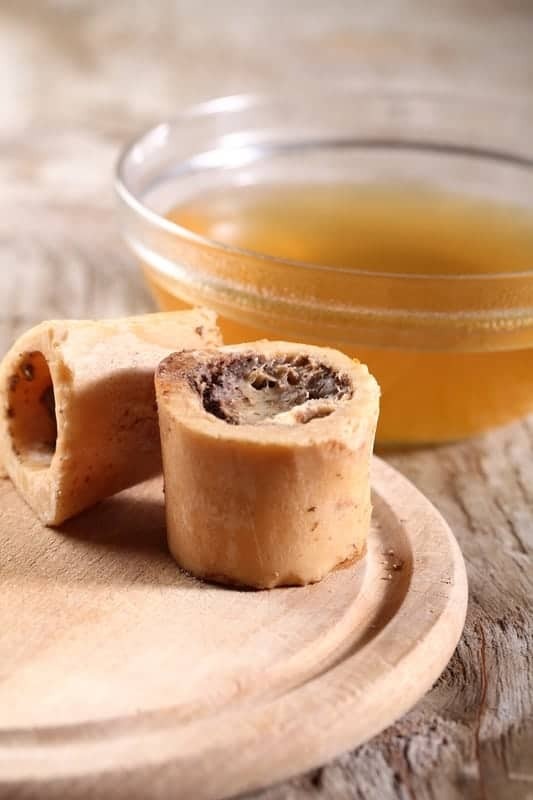 When making bone broth, choose bones from sustainably raised, preferably organic sources. You will be concentrating this broth down quite a bit and you want to make sure the animal was as healthy as possible. Look for bones from grass fed cattle or bison, pastured poultry, or wild caught fish. You can save the bones leftover from your meal, visit your local farmer, or buy bones online at places like U.S Wellness Meats. To make the bone broth: Add the bones and the vinegar into a stock pot and add 1 gallon of water. Let sit 30 minutes to allow the acid to break down the bones a bit. Cool, strain through cheese cloth and refrigerate. Use within 5 days or freeze. For a detailed, step by step post about how to make bone broth check out The Wellness Mama. I will be making some homemade bone broth for myself soon and trying to longer cooking times. I have always cooked mine about 8 hours but now I am thinking that to get the most nutrients from the bones I should be cooking it longer. Have you ever made your own bone broth? We are in the middle of winter here in the southern US and I love that I don't have to feel quite so guilty about keeping the stove burner going for 48 hours...have some simmering right now and the whole house smells so good! My mom uses the bone from ham in her pea soup and in green beans. Adds such a good flavor to the dish. Hmm, the only way I know how to make stock is with bones. In fact when I have animals butchered (deer, goats) I ask for the bones so I can make stock. I guess the "old ways" are coming back 'round again. This is really cool! I have never done this before. I really need to use the bones of the meat for things like this! It looks amazing. Interesting about all the vitamins and minerals. I take a lot of amino acid supplements and I like that bone broth may be an alternative source. I thought it was interesting that bone broth was so full of nutrients, too!